Went for a lovely New Year’s Day run this morning through Lutyens Delhi, and as I ran, I spotted quite a few municipal workers in this pampered heart of the city dutifully sweeping dust from one side of the road to the other. Now I have nothing against dust moving, per se. I really don’t. And I fully accept that the VVIP occupants of Lutyens Delhi may well need their dust brushed from one place to another, but the sooner someone tells these sweepers that they should also become picker-upper-ers the better. For goodness sakes, Delhi, India Gate is your supposed heart. Your showy off centre piece. 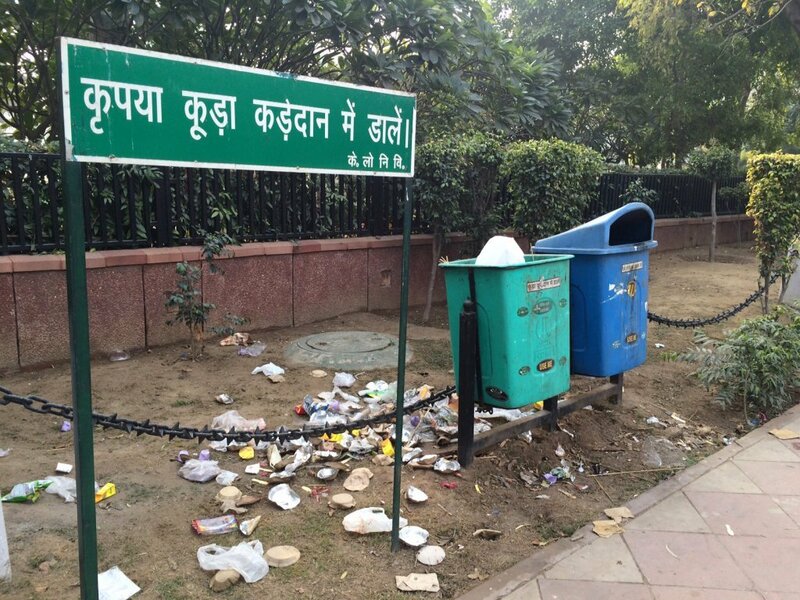 There are actually bins at India Gate (sadly, a functioning rubbish bin is not for all of us). Plus there are signs in Hindi asking you to put your rubbish in these rubbish bins. So here you go, folks. My first agonised Swachh Bharat photo of this year. 50 metres from India Gate. Oh, and to forestall anyone who might be tempted to tell me – as someone rather patronisingly did on Twitter a month or so ago – that Swachh Bharat isn’t about taking photos but doing something, I know that, thank you very much. And I did my bit in the Lodhi Gardens this morning. Every time I came across a discarded plastic bottle, of which there were enough, I picked it up and ran with it to the next bin. Not sure that swinging bins are at all helpful, looks as tho someone has tipped up a full bin to get their bit of rubbish in. Thanks, Anita. Let’s see what happens.